If you’ve been reading this blog for any length of time, you know that my thoughts on the Rules of Golf are that they are unnecessarily complicated. There’s too many of them and it certainly seems like every rule in the book has another one that can contradict and override it, making things more difficult for the players and officials than it needs to be. Now, the violation in question today won’t get as much play as any Tiger Woods fiasco and it doesn’t seem to be nearly as complicated, but it’s worth exploring. It’s really tough to see from this camera angle, but Kim argued that he never grounded his club, and despite it appearing to be the case from this vantage point, he’s obviously the closest to the ball, so he’d know better than anyone. The fact that he put up such a fight with the two-hour argument leads me to believe that he feels like he did nothing wrong in the first place, but clearly the rules committee saw it differently and forced him to sign for a six after voting 5-3 in favour of the violation. Three people voting against the ruling shows that Kim wasn’t the only one who thought that it wasn’t a penalty. It was obviously a higher profile event, but it did take me back to Dustin Johnson’s “violation” at the 2010 PGA Championship. I can’t think of a worse way to lose a tournament. 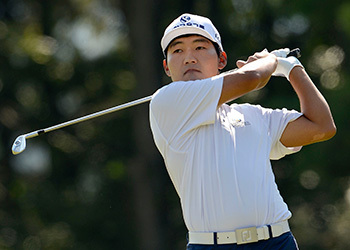 In other news from Korea, Kim ended up tied for second place with Rory McIlroy who fired a final round 67, and will definitely be angry with himself over a third round 75 that left him ten shots back of Kim’s lead. I know it wasn’t a big event with a loaded field, but a T2 should make Rory pretty happy, and with another five events left on his 2013 schedule, he’s still got plenty of time to get into the winner’s circle. If you want to watch highlights of the event, I posted the first two rounds here, and the final two rounds are embedded below.